Facebook Messenger | CommentSold Help Center! In this guide, we'll go over the steps required to setup Facebook Messenger. 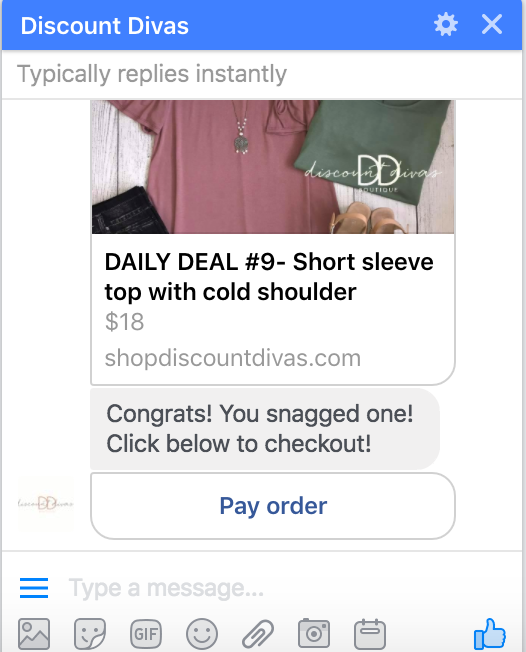 Enabling this feature will allow you to interact with your customers over messenger, by sending them updates about their orders. What this allows us to do is send order update information to your customer! We can also send them messages like "We did not understand your comment" or "Congrats! You snagged one!". There is a list of messages we automatically send at the bottom of this page. This is a highly requested feature and we've seen it significantly increase business in our testing. We believe this is because of the immediate feedback the customer gets. Many times, your customer may not check their emails for order update info or to see if they were waitlisted or not, but they do check their messenger! To setup Messenger, simply go to your Facebook Setup tab and click "Re-Connect Facebook". This will ask you for additional permissions, so that we can send/receive messages from a page. It's worth noting that groups cannot message since they do not have an identity. You have to select a page to message from. Note: For higher volume customers (100+ orders/day) - you should know that your inbox will be flooded because the bot will be sending order updates to people. It will become increasingly difficult to respond to people. You can handle this in one of two ways - either create a new page specifically for the Messenger Bot, or turn on an away-message on your page to say something like "This inbox is not monitored, please email support@boutique.com for any issues"
From there, you will see a list of pages that you control or have administrative access to. Click enable on a single page that you want to use for Messenger notifications. Of course, if you have any issues, just message us from the chat button!